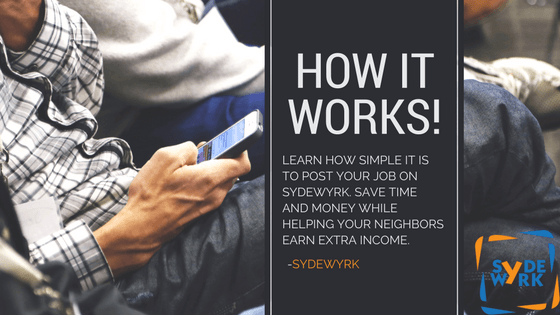 SydeWyrk is working to make our app as simple as possible for home and property owners. Googling service providers, getting multiple quotes, and still not knowing who will perform your job from the company you chose, can be such a headache. We help to simplify the process of getting jobs done around your property, while also helping your neighbors earn money by picking up side work and building their reputation as a great SydeWyrker. Check out the infographic below to get a glimpse of what to expect from posting a job onto our platform. We look forward to becoming “Your Neighborhood Workforce”. Next: Next post: Why SydeWyrk?